I love it when a plan comes together! I managed to tick off 2 recipes from the book. 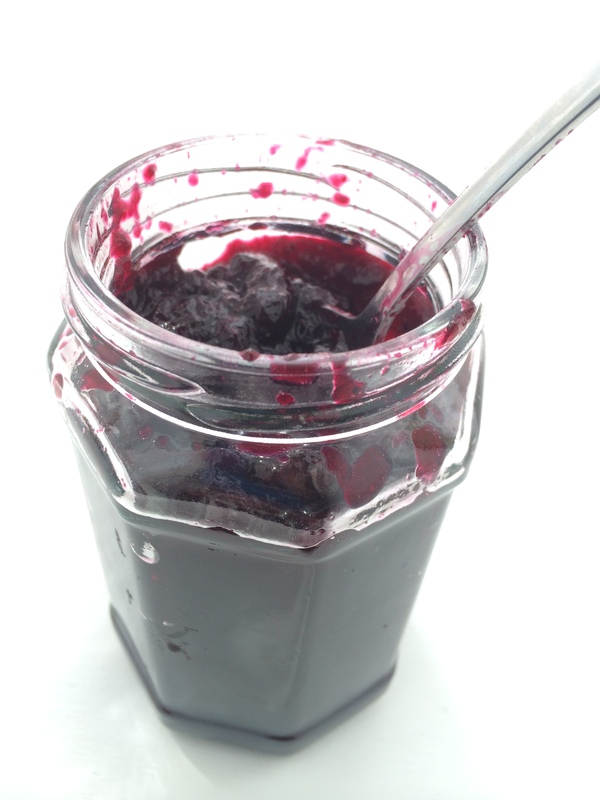 I made blueberry “fruit goo” (page 34). It was necessary because the fruit goo was going to be the topping and filling for the cupcake recipe I was going to attempt. The recipe was so very generous and there is still half a jar of the fruit goo in my fridge. 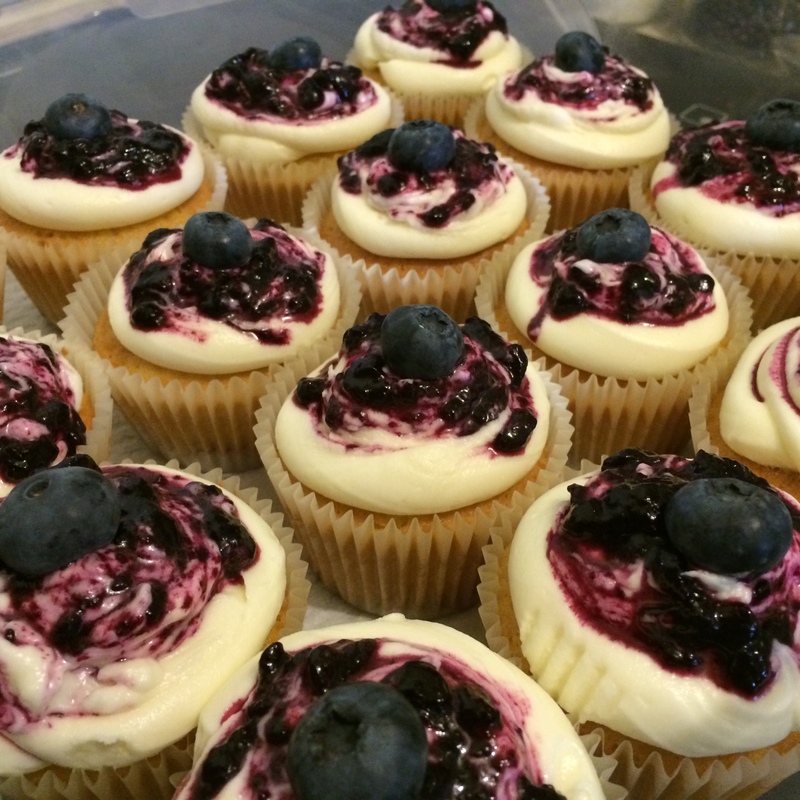 The cupcake recipe I attempted today was the blueberry cheesecake cupcake (page 62). I haven’t been able to taste it because I’ve had too much of the fruit goo and the cream cheese icing, but Alan says it tastes and smells like a cheesecake and I trust his food opinion! So it passes the Alan taste test. It was quite fun to do this though because you built up the cupcake in stages: first you had to put together the biscuit base (like any self-respecting cheesecake, this one, too, has a buttery biscuit base), then put in the cupcake batter, bake the cupcake, then fill the middle with the blueberry fruit goo (for more fruity goodness, I think), and top it with a cream cheese frosting and swirl through even more fruit goo! I had fun doing this. I really did. So, as far as today is concerned, I only have 47 recipes to go and 22 weeks to finish cooking through the book. I am doing a Julie Powell! This challenge that I’ve taken on is getting more and more daunting as I think about it. 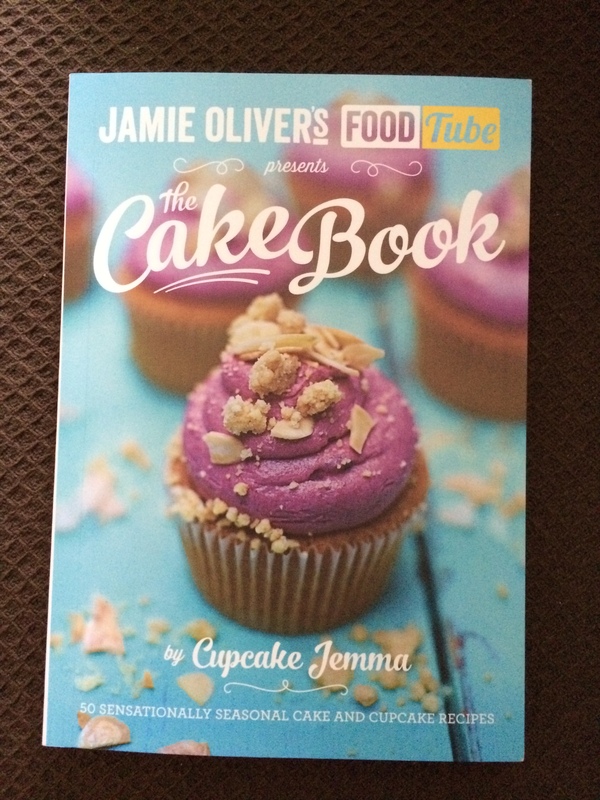 It’s a book from Jamie Oliver’s Food Tube series (I also have the BBQ Book too which is excellent!) published by Penguin Books. The book is called The Cake Book. The recipes are written by Jemma Wilson who is the wunderkind behind Crumbs & Doilies. If you’re into street food, you’ll know that C&D offers a really good range of lovely (heavy on the lovely) cupcakes. I love the mini cupcakes that they offer the most because they are bite-sized pieces of heaven! And they look so cute and dainty, almost too good-looking to eat. Almost. I thought to myself, well, if these are Cupcake Jemma’s recipes, well, they are definitely worth making! There are 50 recipes in The Cake Book. There are 26 weeks left in the year. If I manage 2 recipes each week, I will have cooked through the entire book at the end of the year! I am thankful that I can bring the cupcakes to work or share them with friends. Because my blood sugar would not appreciate the increase in sugar intake! I like that I am in the same situation as Julie Powell was when she started the Julie/Julia project. I have a full-time job and a long commute at both ends of the day (mind you, I’m not sure how long Julie Powell’s commute was!)! Am I crazy? Definitely. Is this self-inflicted project bigger than I think it is? Probably. But am I excited? You betcha! 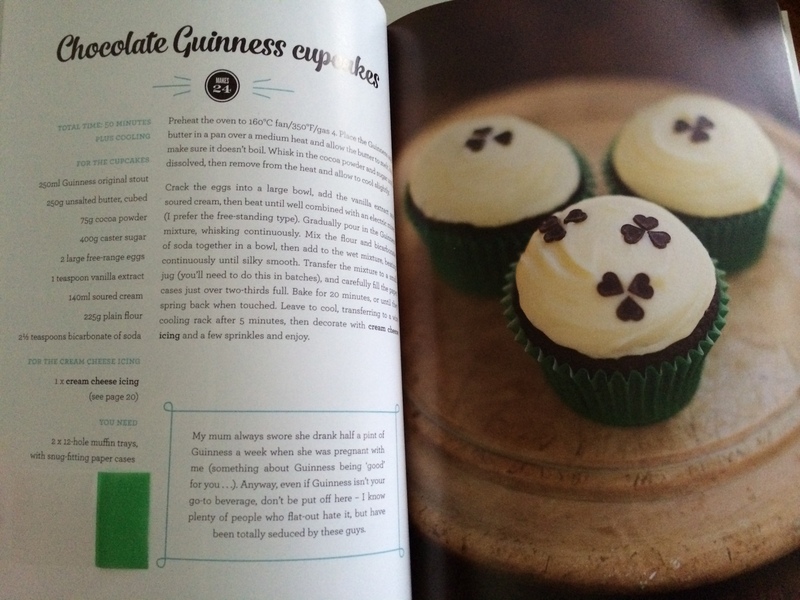 There are so many interesting recipes in the book. I am looking forward to making brittle! If Julie Powell can do it, so can I! 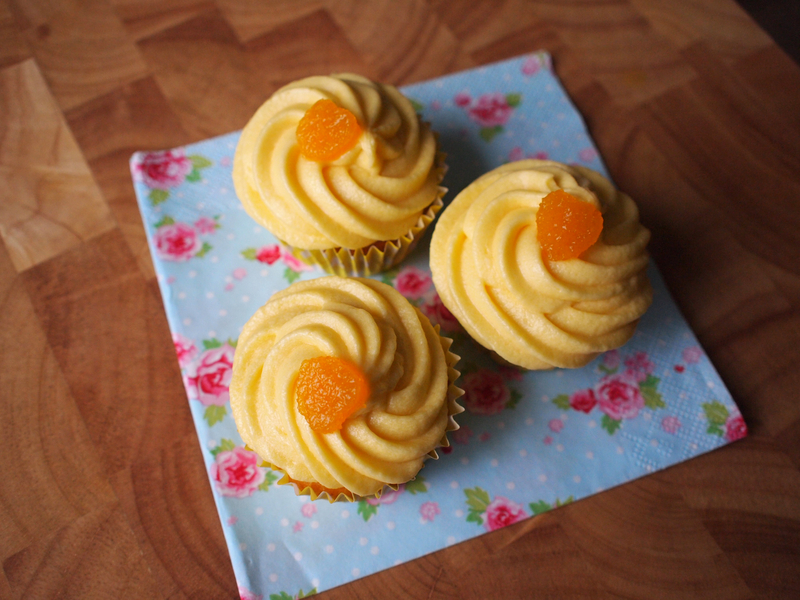 Presenting (finally) the recipe for Mango Love! 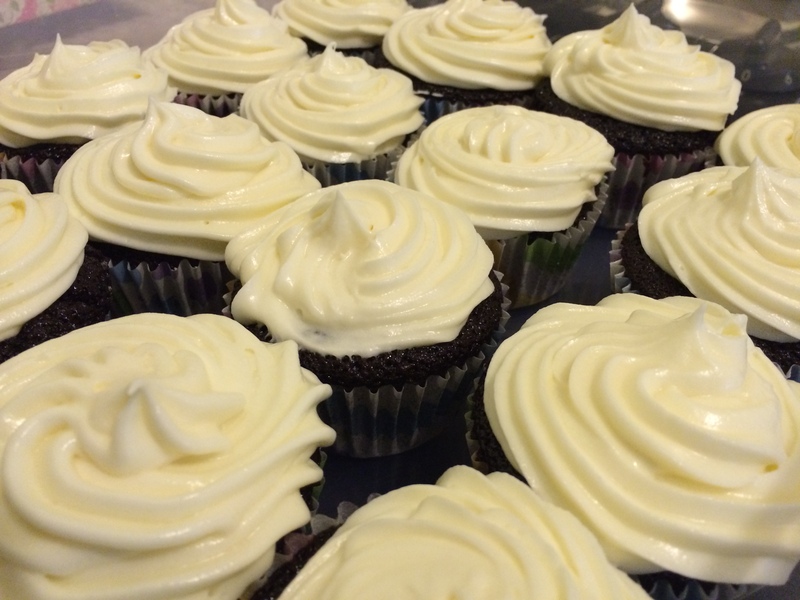 I created this recipe to enter the Emerald Street Cupcake Challenge. While I didn’t make the shortlist (I was disappointed, but I knew my recipe was more tropical than American), the whole process of creating and designing a cupcake was a very enjoyable and very delicious one! 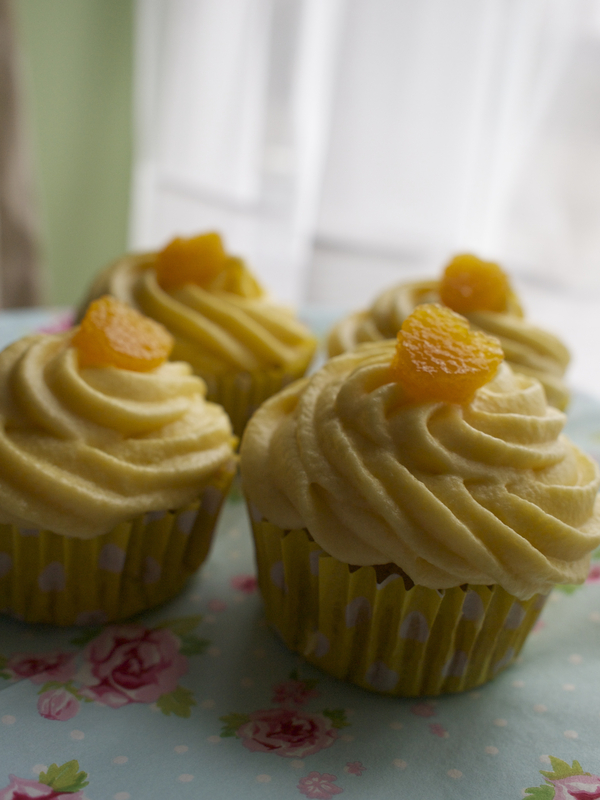 This lovely golden cupcake is offers you a burst of tropical mango sunshine. The twists of lime in the sponge, frosting and mango jelly are added to bring out the mango flavour. 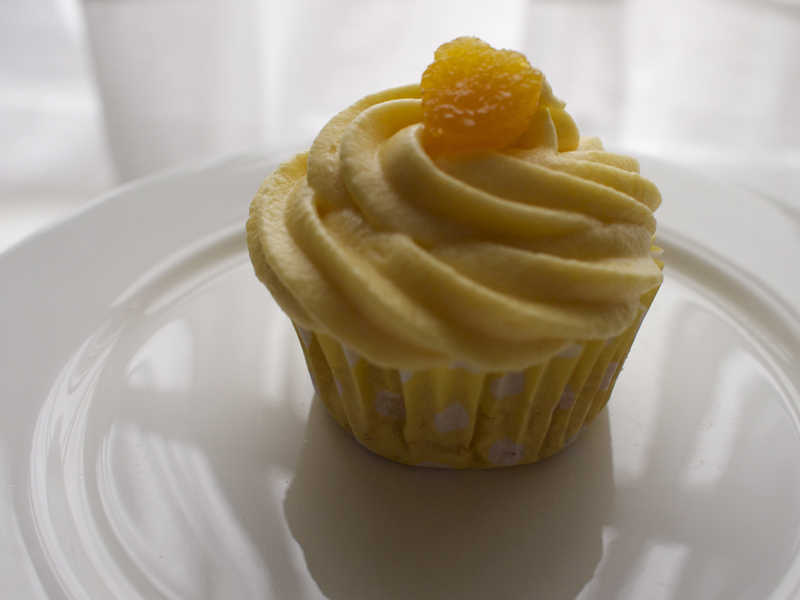 The cupcake is moist and full of fruity mango sweetness. The mango flavour theme continues in its golden yellow frosting. It is topped with a heart-shaped mango jelly piece. This luscious burst of tropical sunshine during the cold winter months that will have you reaching for another…and another! In a bowl, mix flour, baking powder, bicarbonate of soda and salt until well combined with a balloon whisk and set aside. In a small bowl, mix together the mango pulp and lime juice. Set aside. In a stand mixer, cream butter and sugar until this becomes fluffly and light yellow in colour. About 5 minutes. Add egg and mix until mixture is creamy. Add the flour mixture and mix until a heavy batter forms. Add the mango pulp into the batter and mix for 5 minutes until the mango pulp is distributed well. You may have to scrape the sides and the bottom of the bowl to make sure everything is well combined. Spoon into a lined muffin tin. Makes 8 – 10 cupcakes. Bake for 18-20 minutes or until a toothpick inserted in the centre comes out clean. To make the frosting, cream butter and the icing sugar together. Add mango pulp and lime juice until the mixture is creamy. Pipe onto cooled cupcakes. This recipe makes 10-12 cup cakes. I was craving a banana cupcake (with peanut butter!) and, as luck would have it, I had just enough bananas to make up a batch of 12 cupcakes! Sometimes, it’s the simple things that make me really happy. And sometimes, it’s just a banana cupcake! 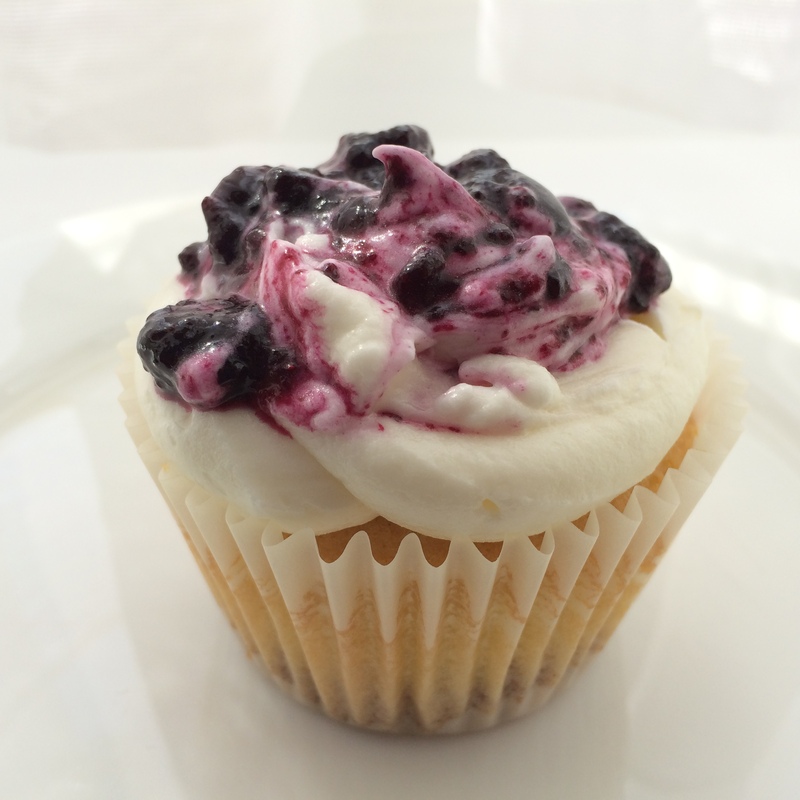 It’s the easiest cupcake recipe that makes the moistest of cupcakes! Preheat oven to 190°C (180°C for fan ovens). Combine flour, baking powder, baking soda and salt in a bowl and mix with a balloon whisk. If you’re making a Christmas version of this recipe, you can add 1 teaspoon of cinnamon and ½ teaspoon of nutmeg. In a separate bowl, mix oil and sugar. Mix until sugar granules appear to be smaller. Add the egg and mix until the mixture is smooth. Add the flour mixture in thirds. Mix in mashed bananas and stir until mashed bananas are well-distributed. Scoop into a muffin pan lined with cupcake cases. Bake for 18-20 minutes. The cupcakes are completely cooked when a toothpick is inserted in the centre of a cupcake and it comes out clean. Makes 12 cupcakes exactly. I use an ice cream scooper to distribute the batter equally.